SEOUL, Oct. 10 (Yonhap) -- When the Korea Baseball Organization (KBO) introduced the wild card in 2015, this is exactly what it envisioned: two teams duking it out for the final postseason spot down the stretch. The top five teams in the 10-team KBO advance to the postseason, with the fifth-ranked team facing the No. 4 team in the wild card game. The top four teams have long been determined this season. And for the wild card, the Kia Tigers and the Lotte Giants are locked in a duel that's too close to call, with only a handful of games remaining. After the Giants walked off on the Tigers 11-10 in 11 innings on Tuesday, they're in a virtual tie for fifth. The Tigers are at 68-72, and the Giants have a record of 66-70-2 (wins-losses-ties), sitting only 0.001 point behind in winning percentage. The Giants have six games remaining, including a double header against the KT Wiz later Wednesday, and the Tigers have four to go. They will face each other three more times this week, starting Thursday at the Tigers' home, Gwangju-Kia Champions Field in Gwangju, 330 kilometers south of Seoul. The regular season wraps up on Sunday. 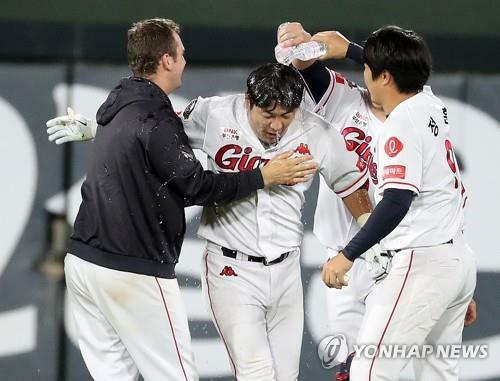 Their most recent showdown took place at the Giants' home, Sajik Stadium in Busan, 450 kilometers southeast of Seoul, and it had the air of a Game 7 of a playoff series. While purists might have turned up their nose at the quality of play -- the teams combined for 13 walks and three errors -- there was no denying the sellout crowd of 25,000 got what they paid for. There were four lead changes, and the teams managed to score 21 runs on 28 hits without the benefit of a home run. With the Nexen Heroes well ahead of the Tigers and the Giants in fourth place, there wouldn't have been this much excitement surrounding these two clubs without the wild card. The sellout Sajik certainly provided a much-needed boost to a league on pace to suffer its first drop in attendance in five years. The Giants have gone 14-3 over their past 17 games and must keep that up to have a shot at reaching their second straight postseason. They have two games in hand on the Tigers. The Tigers won the 2017 Korean Series with relative ease but are fighting just to get back to the playoffs this year. They've been 2-5 so far in October. 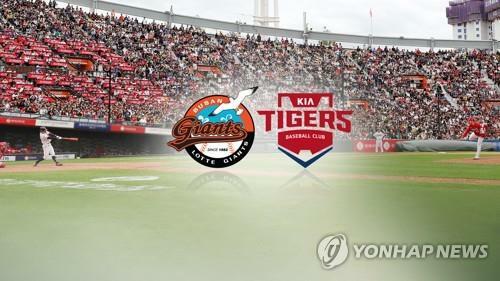 Other than three games against the Giants, the Tigers will face the Hanwha Eagles, against whom they've gone 6-9 in the season series. The Giants lead the season series against the Tigers at 8-5.